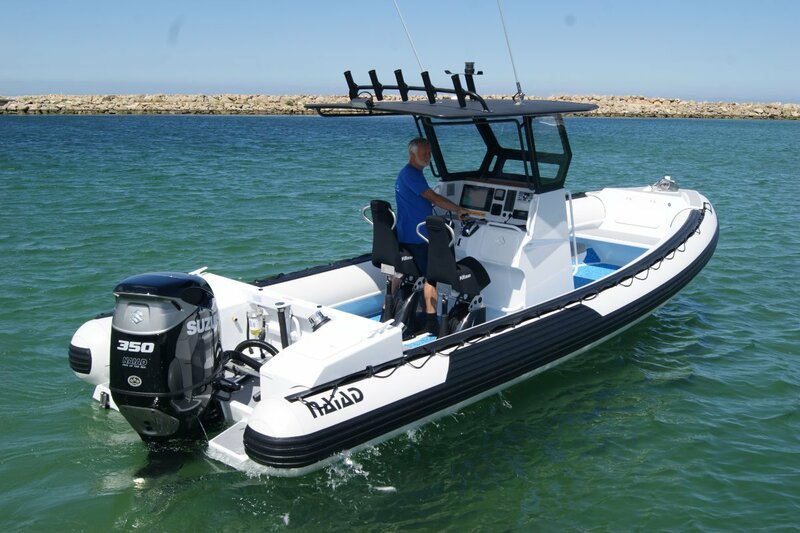 The 6.7 Naiad has been a popular rigid inflatable under the rules for Rottnest tenders; this reviewed version has moved upmarket from the purely tender role. It has also moved further up the horsepower scale. 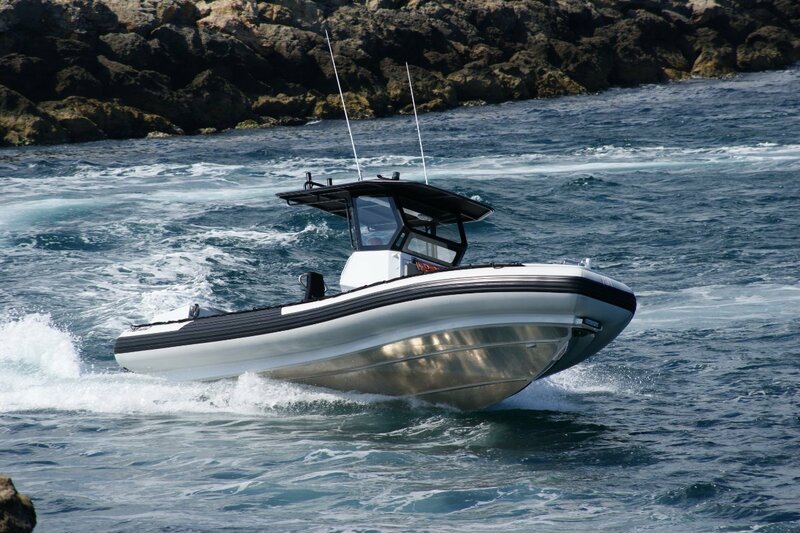 It mounts Suzuki’s biggest motor – 350hp, and fitted with contra rotating propellers. Among other advantages these propellers provide extra thrust; within a finite diameter, there is far more blade area. A typical occasion when this combination of abundant power and grip comes in handy is when running with a big following or quartering sea. Instead of constantly opening the throttle when labouring up the seas and easing when passing the crest, a constant throttle opening does the trick. 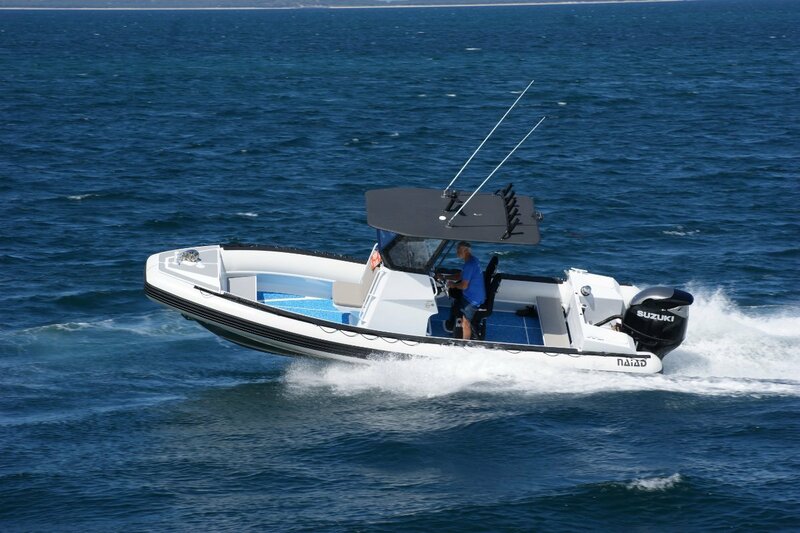 Of course the 350hp also gives a top speed well in excess of 50 knots, which is probably best reserved for protected waters. The 6.7 is still ready to carry out the traditional grunt work of tendering, with plenty of space for passengers. There are official seats fore and aft of the console and at bow and stern. Besides these there is a great length of inflatable tube to sit on and beckets to grab hold of. The centre console is a hefty construction, designed to give as much protection as an island cab. The windscreen and side glass continue to the T-top, adding rigidity to the structure. Tracks have been installed to accept clears that extend to the boat’s sides and also aft. The well braced T-top has been engineered to withstand the immense wind stress at top speed. Two Ullman suspension seats face a dash that says “drive me”. In Kirby style an inventory that has enough items to create confusion is laid out so logically it is memorised in minutes. The dash itself has 12-volt sockets, and the usefully large glove box has USB ports for charging devices. A seat that could take two close friends is attached to the console’s front; under it is space for an esky. 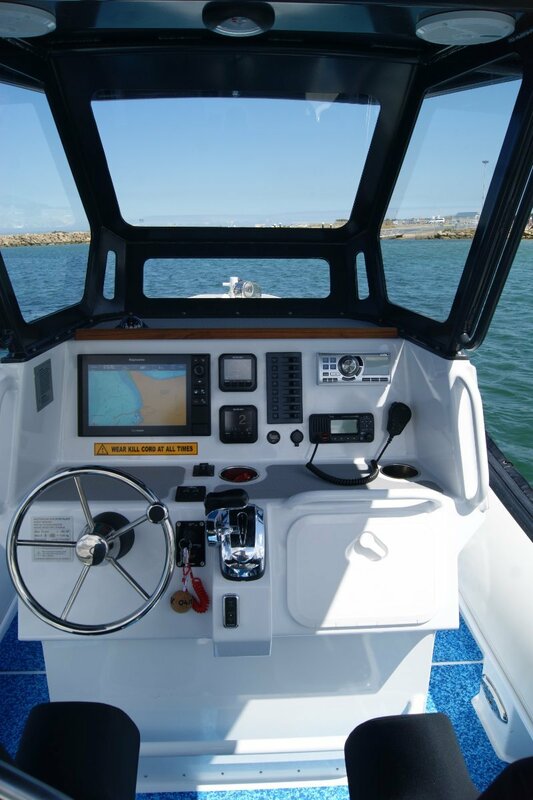 The seat is lifted by gas struts when the console’s front door is opened to give access to the technical side of the electronics and the steering gear. When temporarily alongside to take on passengers, the driver – often the only person on board – needs to secure alongside with just a midships line. And on most boats there is nowhere to secure one. Here though there are beefy folding cleats in each side adjacent to the driving position. The deck is sheathed with C-Dek. This synthetic material is cheaper than teak and probably cheaper than cork. Unlike the other two, C-Dek requires absolutely no maintenance, although you are allowed to wash it. The item that is probably on more boaties’ Santa list than any other is a pot winch; understandable considering the size and ballast weights of the current generation of pots. Hauling gear is pretty much a standard item on Naiads, all the detail of the installation having long been worked out, including the stowage of the hauling arm when not in use. This is in clips under the folding rear cockpit seat. Following the everything in it place theme, the scuba ladder does not merely lift up when out of action. It lifts from its transom socket stows in more clips in the motor splash well. Light bars are trendy fittings, largely replacing spotlights, to help locate unlit buoys and generally assist on the last stretch home. They are usually located on the Targa or the wheelhouse roof, but here it is fitted on the bow beneath the tube. The thinking is glare should be cut because the tube acts as a big light shade. With 3,000 lumens on tap, suppressing stray light sounds like a good idea. Also under the bow is the anchor; this is now the standard location on WA-built Naiads. It is not actually invisible there because opening a small hatch allows the driver to view the windlass and the stowed anchor – or the anchor returning to stowage. The 6.7 does not come cheap, with that spectacular motor having much to do with the price. It is, though, a fine offshore performer, coupling that with duties of express ferry services between Rottnest and the mainland.